In this tutorial, you will learn how to rename multiple user accounts in Active Directory using the LastName, FirstName format. To rename an object in Active Directory, you need to modify the Name property of the object. To generate a name based on first name and last name, you need to use value references %firstname% and %lastname%. Bulk rename is only possible if both First Name and Last Name properties of user accounts are populated. 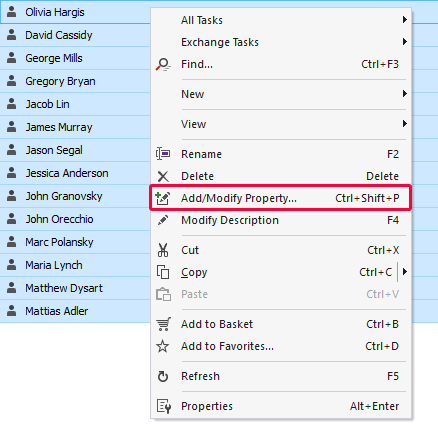 Select the user accounts you want to rename, right-click the selection and click Add/Modify Property in the context menu. If the user accounts you want to rename are spread across different Organizational Units or domains, you can add them to the Basket first. To add an object to the Basket, right-click it and select Add to Basket in the context menu. To modify display names, select the Display Name property. Type %lastname%, %firstname% in the Property value field. During user account creation, the Full Name field is generated in the FirstName LastName format. For instructions on how to change the format, see Change Template for Auto-Generating Full Name.